I love helping my friends and this ice cream was born out of that love. So, I got a text a few weeks ago from my super talented friend Hunter asking me if I knew where to find lavender ice cream. She was in the process of planning a party and wanted to serve it to her guests but had been to every place she knew but couldn’t find it. Being that I have an ice cream maker, I told her I’d make it for her and deliver it. 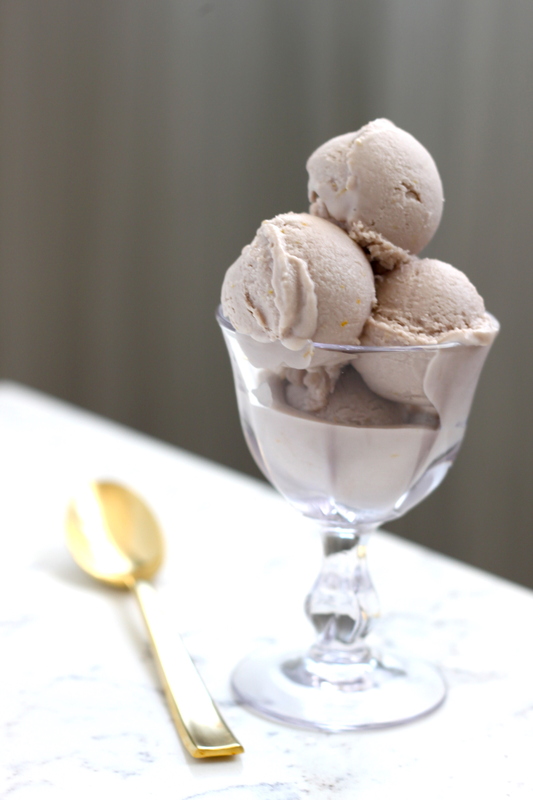 I used my standard base ice cream recipe and played around with honey, zest and lavender extract until I got it just right. The flavor is incredibly rich yet herbal and fresh. The honey and cream create a perfectly sweet base, the lemon and orange zest add a brightness and the lavender adds an incredibly interesting dimension. I got a text after the party saying it was a huge hit! I love when I can help make hosts and hostesses look like superstars! I love helping my friends and this ice cream was born out of that love. 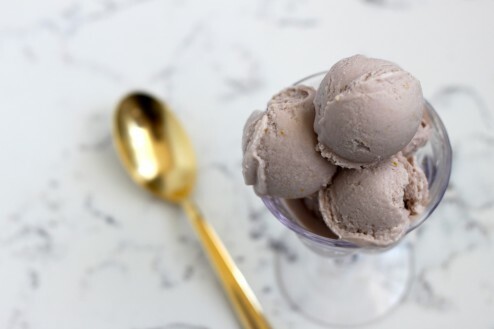 So, I got a text a few weeks ago from my super talented friend Hunter asking me if I knew where to find lavender ice cream. She was in the process of planning a party and wanted to serve it to her guests but had been to every place she knew but couldn’t find it. Being that I have an ice cream maker, I told her I’d make it for her and deliver it. 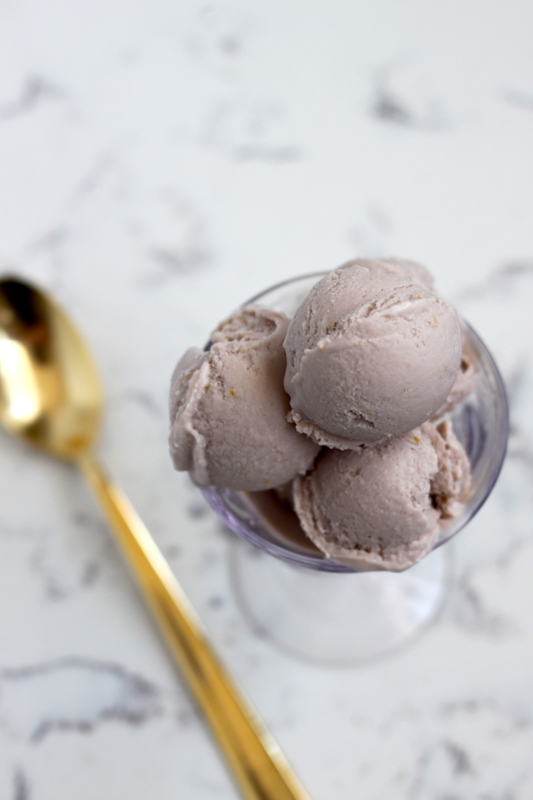 I used my standard base ice cream recipe and played around with honey, zest and lavender extract until I got it just right. The flavor is incredibly rich yet herbal and fresh. The honey and cream create a perfectly sweet base, the lemon and orange zest add a brightness and the lavender adds an incredibly interesting dimension. I got a text after the party saying it was a huge hit! I love when I can help make hosts and hostesses look like superstars! In a medium saucepan, combine the cream, milk, lemon zest, orange zest and honey. Heat over medium high heat until mixture simmers being sure to stir frequently. Remove the saucepan from from the heat and set aside for 15 minutes, stirring occasionally. In a medium bowl, whisk the egg yolks. Temper the yolks by slowly whisking the warm cream mixture into the yolks a tablespoonful at a time, then pour egg cream mixture back into the saucepan. Heat the mixture over medium heat, stirring constantly and scraping the bottom as you stir. While the custard heats, stir in the salt, vanilla and lavender extract. Add 5 drops of blue food coloring followed by 3 drops of the red food coloring. Gently cook until the custard until it thickens, approximately 5 minutes. Pour the custard through a fine-mesh strainer into a clean bowl in an ice bath. Place in the refrigerator until the mixture is cold, approximately 1 - 2 hours. Churn cooled custard mixture a frozen ice cream maker bowl and run according to manufacturer directions. While the ice cream is churning, place the serving container into the freezer to chill. Once the ice cream mixture has thickened, pour in chilled serving container and place in the freezer to set, approximately 3 - 5 hours. I found your site by accident;I have a friend named of the same name, spelled differently; lives in Colorado, who is an organic gardener and a great cook but doesn’t race cars or make Lavender (and lemon zest!) ice cream! I don’t think!! You are an interesting woman. I wonder where it is that you race and if you are a winner in racing as well as cooking? No, I am not coming on to you, even though you are cute; I just wonder if you race and live in New Zealand? Such a gorgeous country, especially the south Island. Your site is great – not cluttered, clean and fresh looking. The right balance of pictures and significance. I like it! Looking forward to your email posts and wishing you a successful next race! Thank you so much for the lavender ice cream recipe!!! Jarrett – thank you for reaching out. I live in Los Angeles currently and my family is from the South Island of New Zealand. 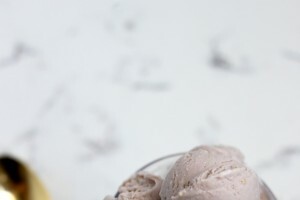 Thanks for the comments on the site, really appreciate it and I hope you get to make the lavender & honey ice cream soon!